In the Pacific Northwest, where she built her career, Greta Matassa wins wide acclaim; four times, the readers of Earshot, the Seattle jazz magazine, have voted her the best jazz vocalist in the Northwest. 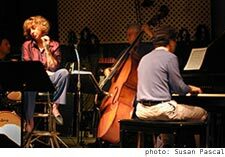 Jim Wilke, the Seattle jazz maven and host of the syndicated "Jazz After Hours" radio program, praises her versatility. "She has a fearlessness in approaching material, Wilke says, "that makes her like an instrumentalist in a jam session. Seattle Times critic Misha Berson described Matassa as a vocal chameleon who "can sound husky or crisp, ebullient or wailing, girlish or jaded. Matassa displays all of those aspects of her talent in this live recording made at Bake's Place, a small club in Redmond, across Lake Washington from Seattle. "Growing up, my parents were big jazz fans and we had a lot of jazz music around the house. They were happy to encourage my interest in music. My father is a visual artist, and we used to spend hours talking about abstract expressionism and how that related to jazz. "We listened to all the great stuff. I really liked the music from the thirties and forties, early Ella Fitzgerald, Billie Holiday. I used to listen to a lot of Fred Astaire, a lot of Frank Sinatra. I never took lessons. While I was teaching myself to sing, my dad and I haunted used record stores. He'd choose anybody he knew that he thought would be interesting, and we'd just pick some people we'd never heard of and bring them home. There was a Dutch singer I liked, Rita Reys. She had a style kind of like Sarah Vaughan. I had never heard of her. I haven't heard of her since. I liked a woman named Marian Montgomery, and one named Pam Gardner. But they were all secondary to Anita O'Day, who was a huge influence on me. So was Frank Sinatra. I loved Frank, and I still do. And Astaire; he phrased the way he danced; so effortless and light and classy. I liked his approach. "I listened to instrumentalists, too, including Dizzy Gillespie and Art Farmer. My dad had a lot of West Coast jazz, Chet Baker, Dave Brubeck, Paul Desmond. I listened to them, but I focused on the singers. I learned by singing along with them. I decided I wasn't going to be disciplined enough to do scales, so I thought, 'why don't I just see if I can find out how Billie Holiday got that sound and how Carmen McRae got her sound.' I'd sing with them over and over. I call it standing on the shoulders of giants. You sort of go along for the ride and see what it feels like. Then, as I got a chance to sing with rhythm sections, I'd experiment, throwing in an Ella Fitzgerald lick or a Sarah Vaughan lick, but at the same time struggling with how to become an individual, which is a lifelong endeavor. I didn't do all that well in school because I was mostly skipping out to work on music." 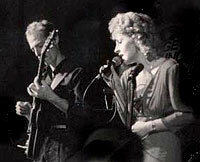 When she was a junior, Greta Goehle dropped out of high school and took a job in Salem, Oregon, with Tim Clark, a pianist and singer. "I just wanted to get my feet wet and find out what it was like. Tim was a kind of a loungy cocktail piano guy, a real Engelbert Humperdinck wannabe," she said, laughing. "He taught me the ropes. He dressed me up, dyed my hair, put Lee press-on nails on me and had me sing 'I Will Survive.' We were working at a country club, making four or five hundred bucks a week, which was pretty good for a 17-year-old. I was there for about a year and finally decided I'd had enough, and wanted to strike out on my own." Back in Seattle, she wanted to sing mainstream jazz, but without contacts in jazz took work in rock bands, and dance top-40 bands. A friend of mine suggested that I do wedding receptions. 'People get paid for that?' I asked. Ironically, that's how I got my foot in the door with jazz musicians, working wedding receptions and corporate parties. The bands rotated their personnel, and a lot of the better jazz players and studio guys came through them. I met the pianists Marc Seales and Barney McClure, and Michael Powers, the guitar player. Around 1985, Michael invited me to join him. I took a couple of players from his band and formed a small trio of my own. Then I hooked up with Jim Rasmussen's Jazz Police, a big band, and was pretty much their vocalist for about a year and a half. Around that time I was also still in a top forty band and starting to do some studio work. I had my finger in a bunch of different pies to try to get as much work as possible. I never had a day job. I just wanted to try to make a living as a singer. Diversification seemed to be the best way to stay employed." She became even more diverse when in 1989 the Pacific Northwest Ballet asked Matassa to step in for Ernestine Anderson in a program based on the music of Kurt Weill. The show, in the Seattle Opera House, gave her wider exposure. "The Weill show ran every two years for about ten years. It put me into the legit field and, eventually, led to Spectrum Dance Theater, which then got a grant and asked me to do a program with them. We debuted it in 1998. It was called Voices of Jazz Danced,' a tribute to fourteen or fifteen jazz singers. In the nineties, I got married and had a couple of daughters. I continued to be very employed, which was nice. I opted to stay local because of the family. But my husband and I divorced, and I decided that if I'm going to make any kind of a career move, I'm going to need to start recording again. The last album I did was in 1994." Craig Baker, the owner of Bake's Place, encouraged Matassa to record at his club. Her tastes run to composers of the stature of Harold Arlen, Irving Berlin, Rogers and Hart, Jimmy Van Heusen, Kurt Weill, George Gershwin, Billy Strayhorn and Duke Ellington. She has an ear, too, for the best works of less famous, even obscure, composers. In this intimate live recording. Matassa opens with "Why Try To Change Me Now," Cy Coleman's first songwriting success, and combines it with "Crazy He Calls Me," indelibly associated with Billie Holiday. She and the virtuoso bassist Clipper Anderson invigorate Gordon Jenkins's "Blue Prelude, a staple of the 1930s, seldom performed these days. Matassa reached back 70 years for "Close Your Eyes" by Bernice Petkere, whose four other published songs include "Lullaby of the Leaves," also a favorite of jazz musicians. The Hollywood soundtrack composer Heinz Roemheld had an even smaller output of two songs, one of which was "The Valentine Tango." Still, Roemheld batted .500 because "Ruby" became a huge hit following the success of the 1953 film Ruby Gentry. Matassa told the audience at Bake's Place, "It's about a woman, but I switched the lyrics around so it would work for me." Matassa integrated the selection of songs with her choice of musicians. 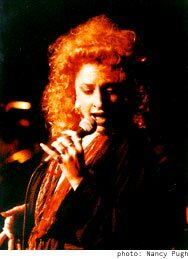 She works often with Clipper Anderson, pianist Randy Halberstadt, drummer Mark Ivester and vibraharpist Susan Pascal. She and Halberstadt had collaborated on her show paying tribute to Ella Fitzgerald and Billie Holiday, adapting arrangements from Fitzgerald and Holiday recordings. Now, they were free to work on original approaches. "Randy and I got to talking about how nice it would be to actually have a chance to do some arranging of our own. I have such respect for these musicians. They're so good that we could have done just about any kind of standard. A pet project for years has been collecting songs that I think are not done enough. There's a whole slew of obscure Harold Arlen tunes that I would love to have a chance to do: 'It Was Written in the Stars,' for example, 'Sing My Heart,' 'I Wonder What Became of Me.' "
The title tune of this CD is an object of Matassa's rescue mission. Frank Sinatra recorded Jimmy Van Heusen's "All This and Heaven Too" with Tommy Dorsey in 1940. Chris Connor revived it in 1955. Since then, it has been largely untouched. Her close connection to the audience is a vital reason for Matassa's success. Lately, she has taken to letting the audience call the tune. She delights in encouraging her listeners to program an evening. It started, she said, when she was playing a gay club, Kid Mohair, on Seattle's Capitol Hill; with some trepidation, she asked for requests. To her surprise, the customers asked for songs by Billy Strayhorn. "I have certain prerequisites," she told me. "I say 'no Mariah Carey, no Engelbert Humperdinck, very little Shirley Bassey.' " Good decision; given the quality of songs and performances in this collection, "Goldfinger" might have been a bit obtrusive. Doug Ramsey is the author of Jazz Matters: Reflections on the Music and Some of its Makers (University of Arkansas Press). He is a contributor to The Oxford Companion To Jazz (2000), a regular contributor to Jazz Times and the winner of an ASCAP Deems Taylor Award for writing about the music of Bill Evans.